Oh and it’s also loaded with sauteed onions. More like ‘quiche amaze’, right? You always see it served beside a virtuous green salad, but let’s be honest, quiche lorraine, with its custardy filling, dotted with bacon and sitting on a base of flaky pastry, is a bit of an indulgence. We’re here for anything that ratchets that up. And even if it’s technically messing with a classic, a sprinkling of sharp Gruyère cheese is just what this rich — but quite subtle — quiche could use. Oh, it’s also loaded with sautéed onions and thyme. More like ‘quiche amaze’, right? 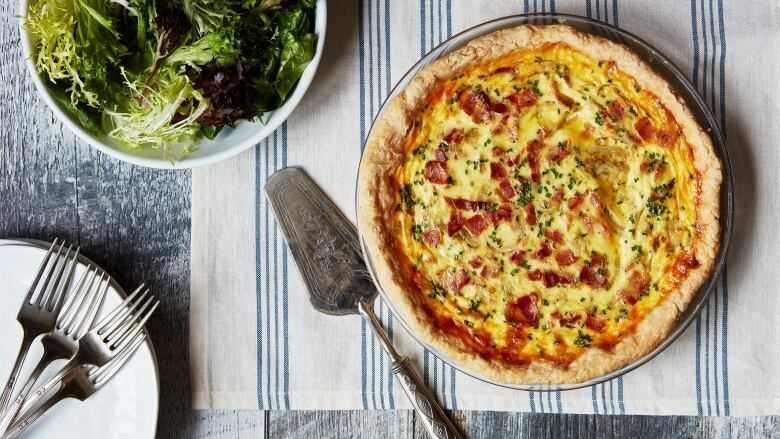 Classically Quiche Lorraine is simply made with bacon but this take is loaded with onions, Gruyère cheese and bacon. You can substitute Emmental or Swiss cheese for the Gruyère if you’d like. Whisk together the flour with the salt; cut in the butter until the mixture resembles a coarse meal. (A few larger pieces of butter are okay.) Using a fork, stir in the water until dough starts to come together, adding 1 to 2 teaspoons more water if needed. Shape the dough into a ball and flatten it into a disk. Wrap in plastic wrap and refrigerate for 30 minutes. Preheat oven to 400F degrees. Set the rack to the bottom third position in the oven. On a lightly floured work surface, roll the pastry to fit a 9-inch pie plate. Place the pastry into a pie pan, pressing it into the bottom and sides. Trim the excess edges and discard. Press the edge of the pastry with a fork or flute it with your fingers if desired. Chill for 30 minutes. Prick the bottom of the pastry all over with a fork. Line it with foil or parchment paper and fill it with pie weights. Bake it for 20 minutes, then remove the foil and weights. Bake further until the pastry is lightly golden brown and set, about 5 to 10 minutes. Cool completely on a wire rack. Preheat oven to 350F degrees. Cook the bacon in a skillet set over medium heat until it’s golden brown and crispy. Transfer to a paper towel-lined plate to drain the oil. Remove the bacon fat from the pan (discard it or reserve it for another use). Melt the butter in a skillet set over medium heat. Cook the onions, thyme, and half of the salt and pepper, until they are tender and lightly golden, about 8 to 10 minutes. Cool completely. Whisk together the eggs, egg yolk, cream, chives, nutmeg, and the remaining salt and pepper; set aside. Scatter the onions, bacon and the cheese over the bottom of of the pie crust. Pour the egg mixture over top. Bake in the centre of the oven until the filling is set but jiggles slightly in the centre, about 35 to 45 minutes. Let stand for 15 minutes before slicing. Serve warm or at room temperature.